When I first saw swatches of Graphite I thought I just looked like a blackened silver foil. But then reading peoples descriptions of the colour, they kept mentioning that it had gold flecks as well as silver. It's very hard to capture the gold and silver flecks with the camera because it is so metallic and reflective. When I bought these two Chanel polishes, I put Peridot on first for a quick swatch and photo, then I put Graphite on and was amazed a how beautiful it was. I really didn't think I would like it as much as I do. I originally only swatched four fingers, but after seeing it on, I had to finish my mani off and then continued to wear it for three days. This was two coats with no base or top coat, just Graphite it all its naked glory. This photo shows some on the golden flecks mixed amongst the silver ones, particularly in the bottom part of the photo. Here is a shot in the shade, blocking the light source so you can see the speckled appearance of this polish. What I love about this polish is that it's not just a silver foil. The gold flecks in it warm it up. I'm a total gold jewellery wearer. Rings, bracelets, watch, all of them gold, and this polish compliments them so nicely. I'm so emmensly happy with my first experience with Chanel polishes. I hope they continue to step outside of the box and create unique colours and finishes, because God knows we are all getting a little bored of seeing the same shades recycled around. Graphite is absolutely incredible, I thought I'd like Peridot more, but Graphite is miles ahead. Great swatches! Others really thought Peridot was the winner here. I prefer Graphite in this collection. It's the one that I found the most interesting with the pewter but still silver and gold peeking out. Peridot had too much glaring gold staring back at me. This is a pretty color-but I don't like it enough for the price! I was really surprised how much I loved this polish. I managed to not want it for a long time, but then right before I was putting my order in for Peridot, I saw some amazing swatches of Graphite and cracked. So glad I did! Graphite has become my go to polish. It's quick to apply, the formula is fab, and it suits just about any outfit. Love Graphite! Your macro shot has me convinced! =) Will need. That is very beautiful but I won't be paying that price for it. Kristy - can't wait to see your swatches. I know you will love it! Jaztee - I'm torn between the two, I think they are both fantastic polishes. 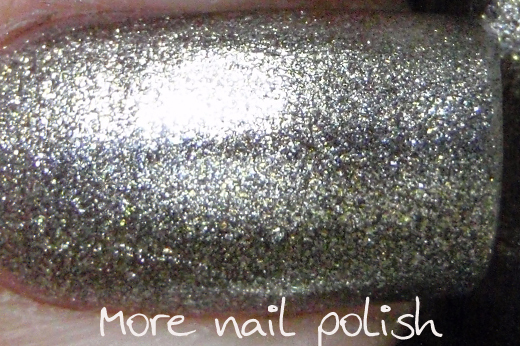 olgiepolgie - Carbonite from Revlon is meant to be similar, but without the gold, which is what makes this polish special. But I don't know if we will get it here. You never know, maybe Ulta3 will do it? They made a perfect paradoxal dupe with Twilight Fever. gnoma - mattified, OMG yes, I will have to do that! beachgal - I'm a gold lover, so I still love Peridot, but this is such a nice change. Cali369 - Yep, that speckled indoor pic makes it look awesome. Beautiful Nails - thank you, it sure is. Fingers - I know, the price is a killer, but this is the first time I have splurged and I'm so glad I did. Theomanic - totally agree about Carbonite, without the gold theres nothing special about it. Just like you I'm so glad I got both. I was pleasantly surprised with the wear too, I got a few days out of it while on holidays. Mel, Glassflecked. - Do it, it's $$$$ but so worth it. Connie - at $39 here in Australia it's a big price to pay. Even on ebay the cheapest you can get it with postage is $35. I don't regret a single cent though.